I started doing piano freestyles over popular music a few years ago as a way to train my ears and improve my ability to play by ear. This time, I'm playing along with Mobb Deep - Shook Ones Part II. This is just something I do to have fun and work on my ear training. I am not a pianist at all and I don't know how to play piano like a pianist. I just try to make the keys play what I hear in my head. A piano freestyle is a piano improvisation over a beat. The piano parts being played are unrehearsed and created without any prior preparation. Improvisation is common in Jazz music and the berval dorm of improvisation is often found in Hip-Hop freestyles or "off-the-dome" ("off the top of my head") lyrical performances. 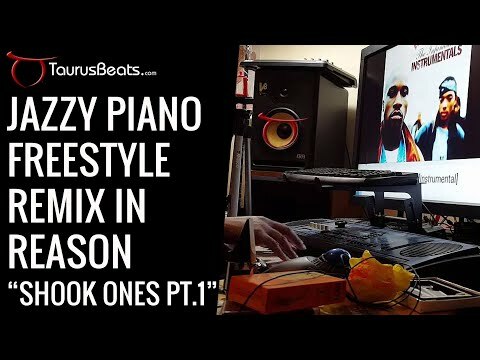 My piano freestyle videos capture moments in mt creative process when I am "in the zone" resulting in unique performances. I started with Reason when it first came out and I have been using it ever since. When you find something that works well, stick with it. I bought my Yamaha DJX more than 17 years ago. It still serves me well tofay. I have tried other keyboards and controllers, but I come back to the DJX everytime. My current music computer is a custom-built AMD quad-core system running Windows 10. My home music studio is nothing big at all. I'm using one room in my home, dedicated to making music. Nothing fancy, just the tools and equipment I need to make the moody instrumental music I hear in my head. If nothing else, I hope to show that it doesn't take a lot of fancy, expensive equipment to make great sounding music. My music production sessions are simple. I try and produce/create as much music as I can within one hour. I see it all as practice - preparation for something big. The videos I make showing some of these sessions have been a real inspiration and help to other artists and producers. I have been making Moody Instrumental Music for more than 20 years using the name TaurusBeats. More recently, my friends over at the Computer Music Academy have modifief that to TaurusBEAST. Making beats using Propellerhead Reason is just one part of my music journey. I play drums for a local church now and I have played as a professional and session drummer for several artists. Making music and helping others make their music better have always been a major part of my journey. That's why I setup the TaurusBeats.com website to showcase my music and create content to help other music producers and artists. Reasons I make piano freestyles include: develop music skills, make music, reach, teach, mobilize and inspire people. My music reached people around the world and my piano freestyles have inspired people to create and seek out ways to better themselves. Contact me and let me know what you think. As with all of my piano freestyle videos, this recording is the only version of the "song" that I'm making up on the fly. I'm not able to perform this version again...yet.